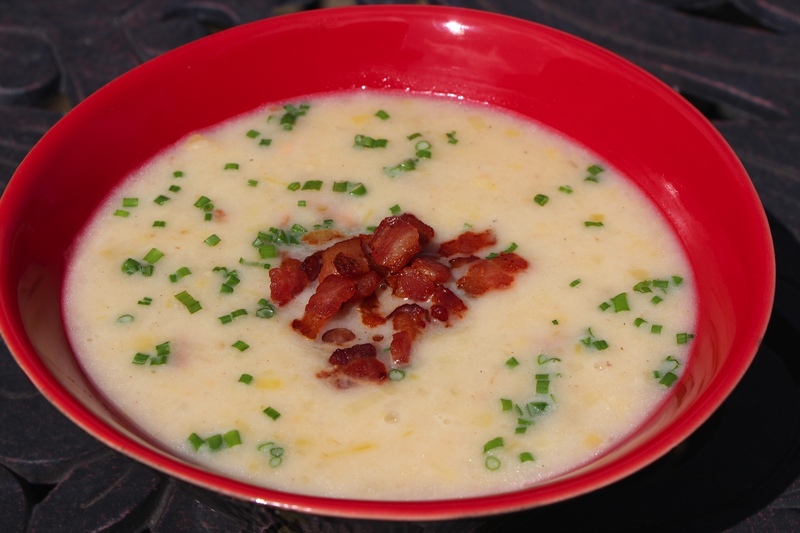 Bacon, potatoes and leeks-you couldn’t ask for a better combination in a soup! It’s a meal in a bowl! Don’t be afraid to use plenty of salt as the potatoes really can stand up to a lot of seasoning! If not using homemade stock, be sure to use stock that is low or no sodium! Place oil and the bacon in a small, cold skillet over a medium heat and cook until the fat has rendered from the bacon and bacon is crisp. Transfer with a slotted spoon to a paper towel lined bowl to drain. Reserve the bacon fat for the soup if desired. In a large, heavy bottomed pot (6-8 quarts), over a medium high heat, add butter or bacon fat (if using). Add the leeks and couple of pinches of kosher salt. Sweat the leeks, stirring occasionally, until the leeks have softened and given up most of their moisture, about 8-10 minutes. Add the white wine and scrape up any of the browned bits on the bottom of the pan. Cook until the wine has evaporated. Add the stock, potatoes, thyme and bay leaves. Let this come to a simmer and reduce heat to medium low and cook for about 30 minutes or until the potatoes are soft and cooked through. Remove the bay leaves and with a potato masher mash the potatoes until smooth-leaving some small bits of the potato in the soup. Add the cream and heat for another 5 minutes. Taste and adjust seasoning with salt and pepper. Remember not to be shy with the salt here! Ladle into bowls and garnish with the bacon and chives.